In July, I will be attending the Grand Tournament Heat at Warhammer World. This is my first time visiting Warhammer World, so I will be looking forward to the trip. I was hoping to actually get a ticket for one of the later heats so that I could practice with my army more, but by the time I remembered that the tickets were on sale, Heat 1 was all that was left. 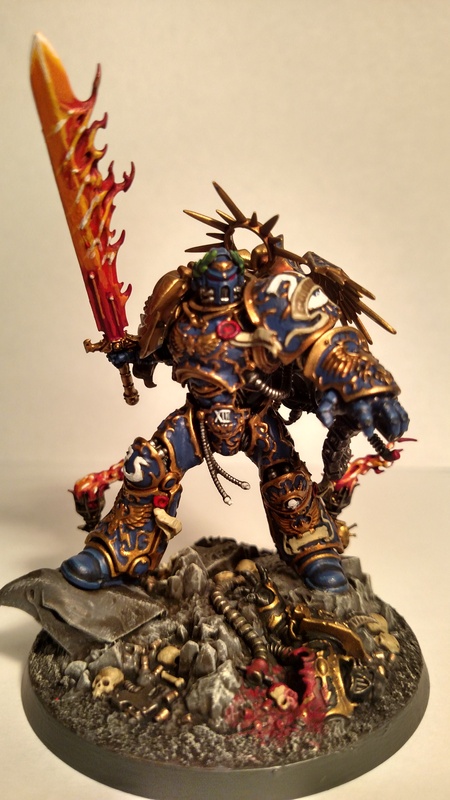 My original plan was to take a Deathwatch army to the event. However, after reading the missions pack, I realised that we would be using the Eternal War mission. 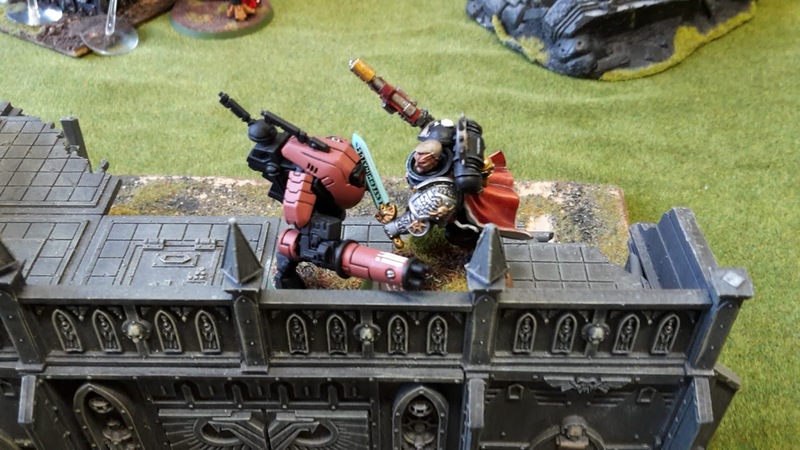 I love the Deathwatch and the new codex, but the army still has a problem with staying power and lasting till the end of the game. As a result, I've been experimenting with some Astra Militarum allies to boost my numbers, as well as providing some useful anti-tank firepower for my army. 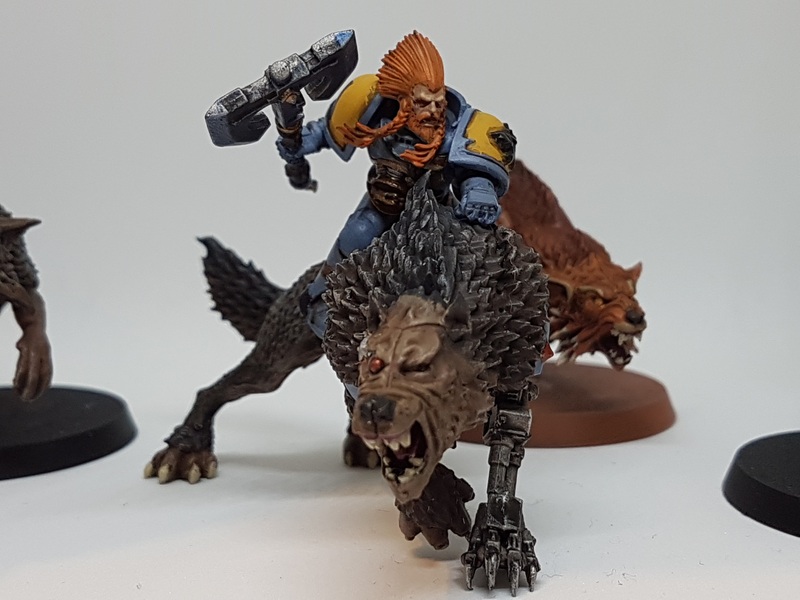 After playing a few games with the Deathwatch alone and one with some AM allies, here is a list I am thinking of taking along. 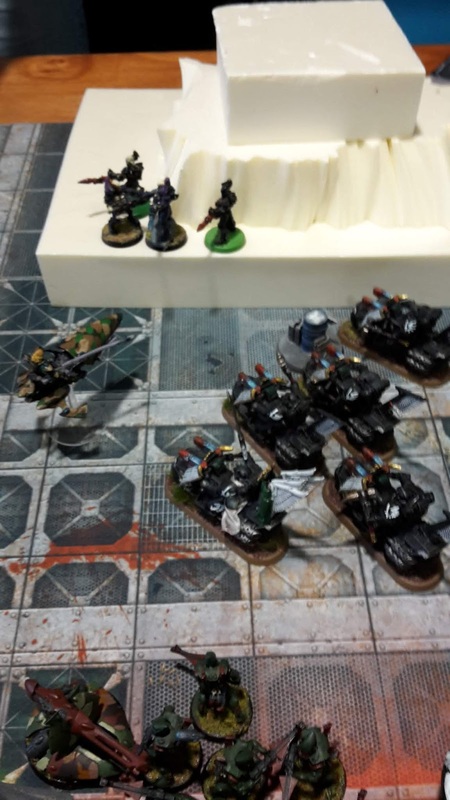 This week's battle report sees my Deathwatch army take on Ben's Thousands Sons in the Contact Lost maelstrom of war mission. Contact Lost is the mission where you get one card on turn 1, followed by a card for each objective you hold in the following turns, and we would be using Vanguard Strike deployment. 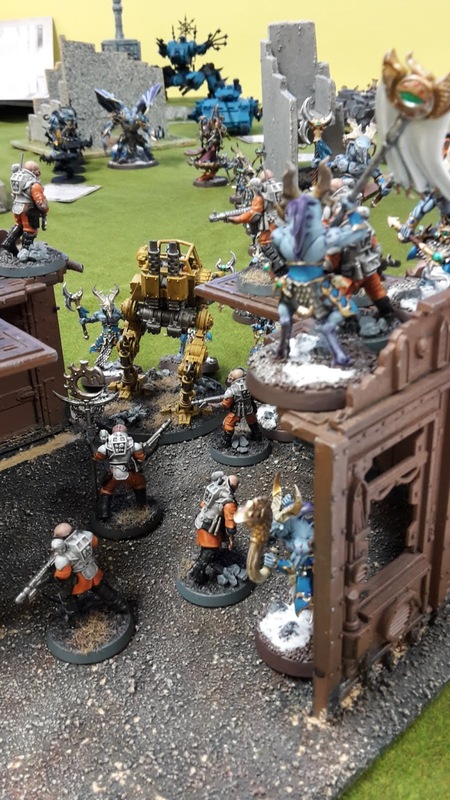 This week's battle report sees my Deathwatch take on Dean's T'au in the Contact Lost maelstrom of war mission. 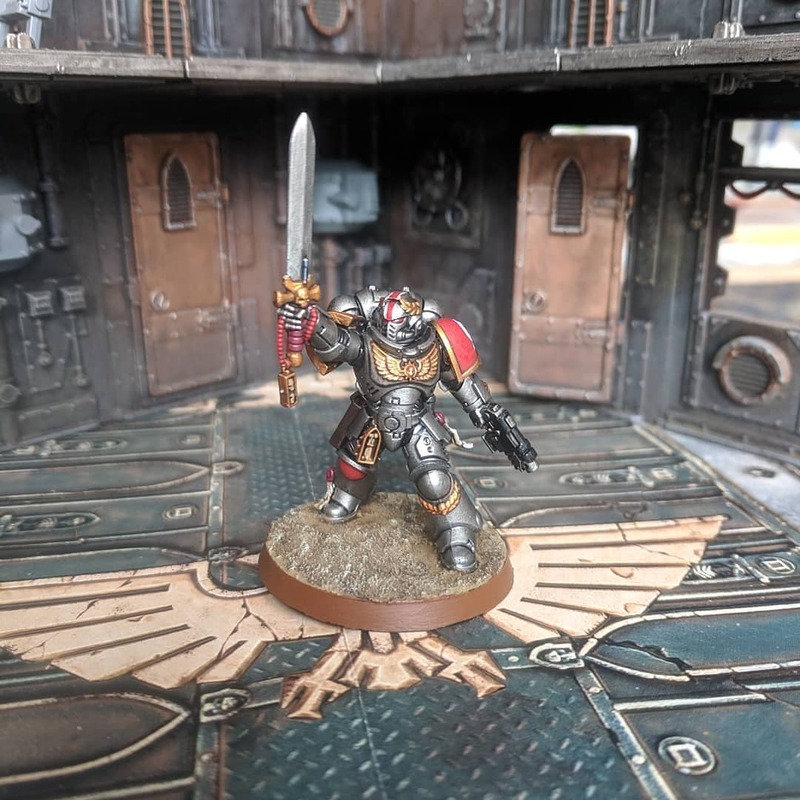 I've been quite enjoying having my Deathwatch back on the table in 8th edition, thanks to the recently released codex giving them a new lease of life on the tabletop. 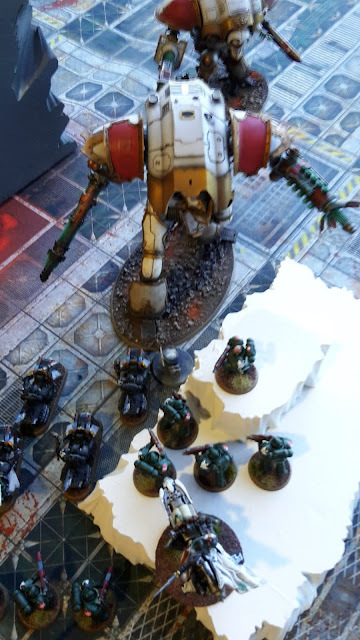 I went for a good mix of Veteran Kill Teams, as well as a borrowed Redemptor Dreadnought from my Dark Angels army. 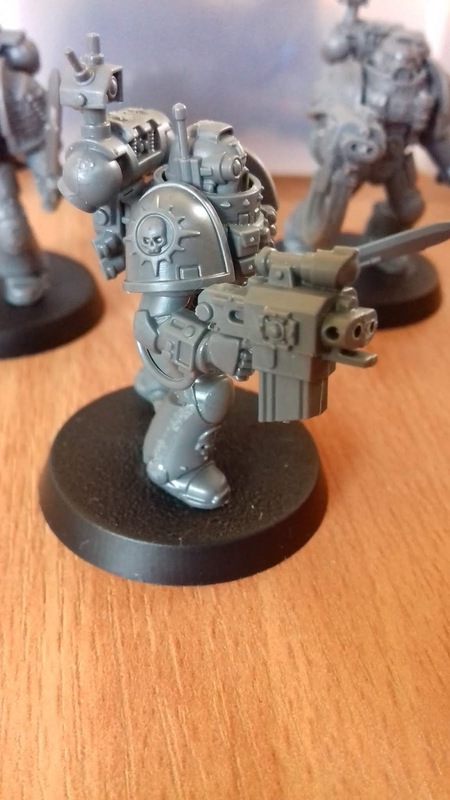 I think two Battalions is the way to go with Deathwatch. 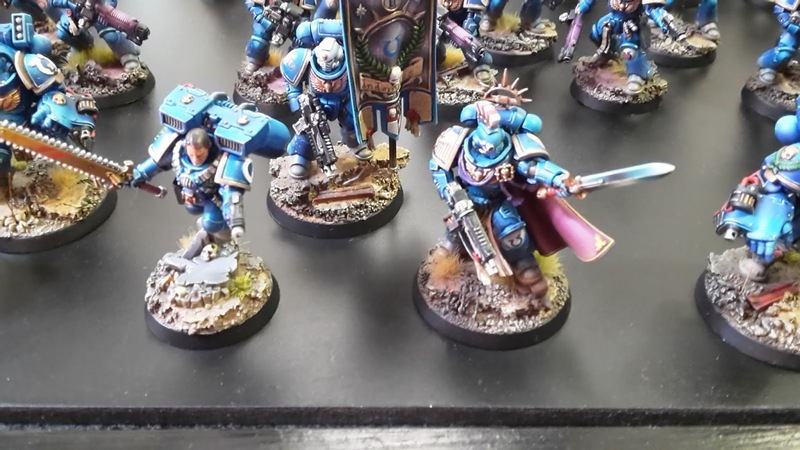 They need a good number of command points to use their stratagems, and they have solid troops choices to make going for lots of Troops options more than worthwhile. 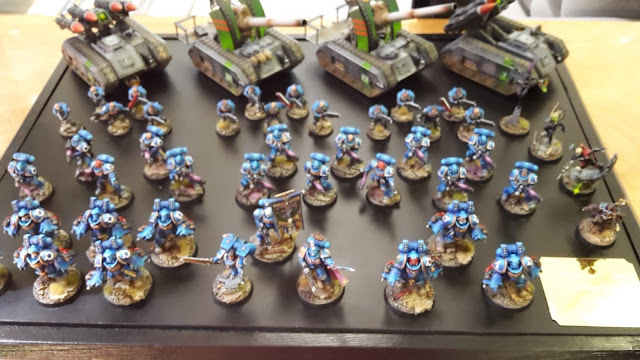 As is customary after I attend a tournament, I take a look at my army to see what performed well in the list and what could be changed to improve the list in future games. Overall, I think the army did reasonable well. Of my four games, I won two and lost two. Some recording errors in one of the games (Game 3) meant that I may have actually been able to pull out a win in three of my games. I'll take a look at the unit in the army and how they performed during my tournament games. 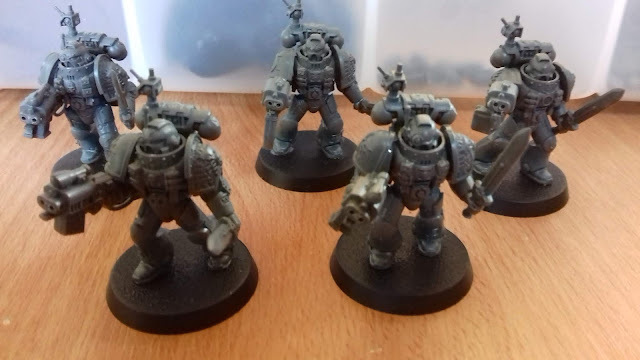 Today's hobby update features some more reinforcements that I have made for my Deathwatch army. I converted some Deathwatch Veterans to be armed with Storm Bolters. 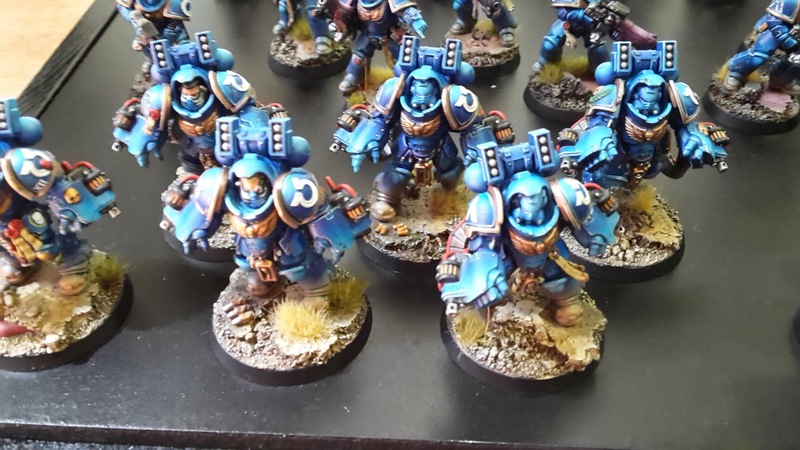 These are a powerful option in the new codex and I wanted a unit to represent them on the tabletop. These use Storm Bolters from the Sternguard Veterans box, as well as a couple of Terminator Storm Bolters that had the hands replaced. 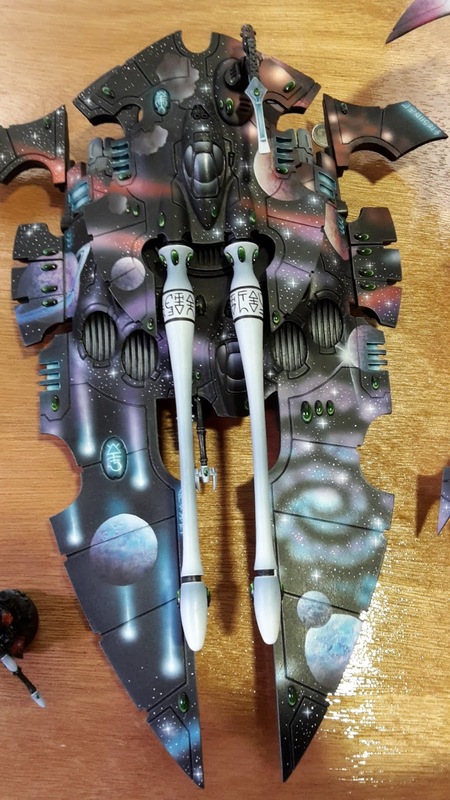 Today I have the photos of the Best Army nominations from the recent London GT. 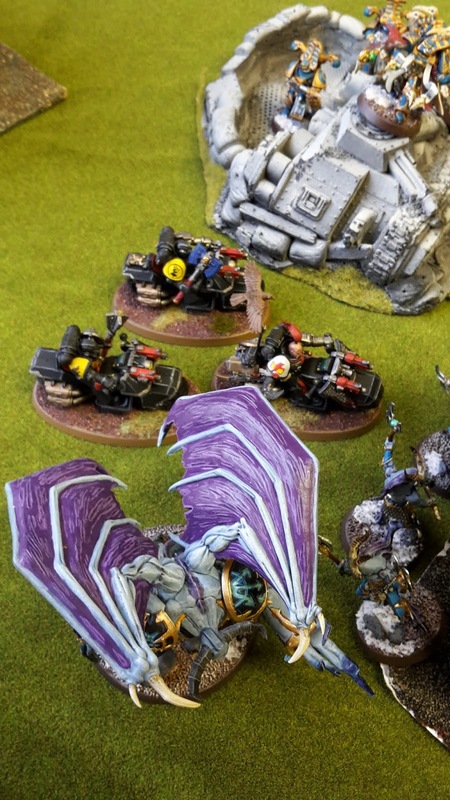 My final game of the London GT saw my Dark Angels take on Malcolm's Alaitoc Aeldari force. 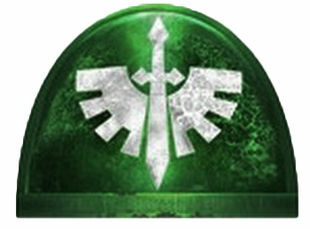 The Eternal War mission was a modified Frontline Warfare mission. There were four objectives, and you scored points for each objective you held at the end of your turn. The objective in your deployment zone was worth 1 point, the objective in your opponent's deployment zone was worth four points, the two in the centre were worth 2 points each. The maelstrom of war mission was Kill Confirmed. This was 3 cards per turn and one kill point for each enemy unit destroyed. You could not discard any cards that required you to kill enemy units. 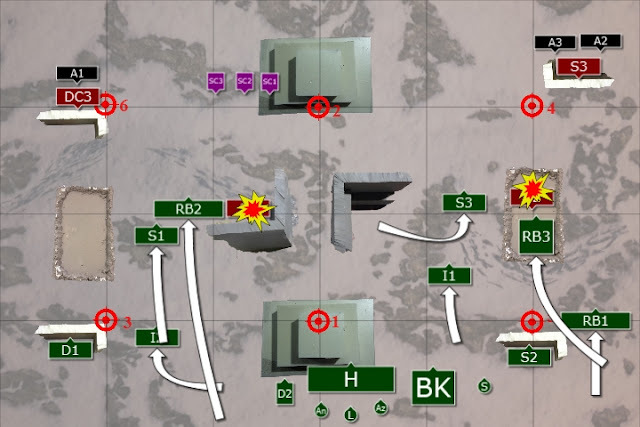 This used the Frontline Assault deployment zone. My third game of the London GT was really game four of the tournament. 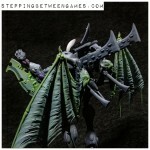 This game would see my Dark Angels take on Steve and his Astra Militarum force. This game was using a modified Resupply Drop for the Eternal War mission. In this game, at the start of each player's third turn, they choose three objectives and randomly determine one to be removed. The other two (so four in total) are worth 3 pts at the end of the game. The maelstrom of war mission was Race to Victory. In this game, you get three tactical objective cards per turn. As soon as a player scores 10 cards, the maelstrom mission ends and no more cards can be scored. The first player to score 10 cards also gets 3 bonus points. We would be using the Search and Destroy deployment zone (table quarters). This was annoying. I was playing Guard on the only mission that didn't use kill points, and also on the furthest away deployment zone. Game 2 of the London GT saw my Dark Angels take on a mixed force of Space Marines, including Blood Angels, Raven Guard and Adeptus Custodes, commanded by Phil. This was my first time taking on the dreaded Custodes Shield Captains, so I was interested to see what they could do. The Eternal War mission was No Mercy, so kill points for each enemy unit destroyed. The Maelstrom of War mission was Spoils of war. This gives you three tactical objective cards per turn, you cannot discard "Secure Objective X" cards and can steal your opponent's "Secure Objective X" cards. We were using Dawn of War deployment. Welcome to my first battle report from the recent London GT. Game 1 saw my Dark Angels take on an army of Imperial Knights, commanded by Connor. 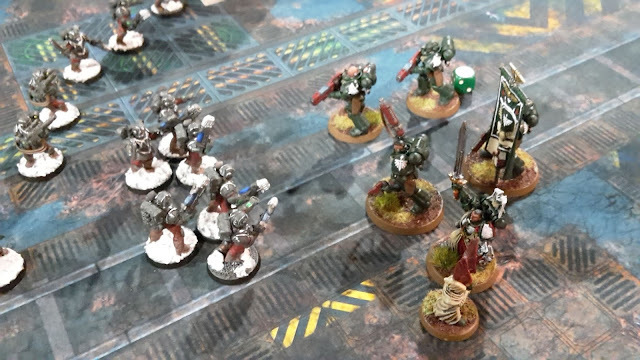 This was Connor's first 40k tournament, so I was hoping he would have a fun game. This was an ETC mission, featuring an Eternal War and Maelstrom of War mission at the same time. The Eternal War mission was Dominate and Destroy. This featured 6 objectives and you scored a point for each objective you held at the end of your turn, as well as a kill point for each enemy unit destroyed. The Maelstrom of War mission was Tactical Gambit. In this game, you get four cards per turn, but must bet how many you will score before you draw your cards. If you match your bet, you get the bonus points, otherwise your opponent gets the points. We were also using Search and Destroy deployment (table quarters). 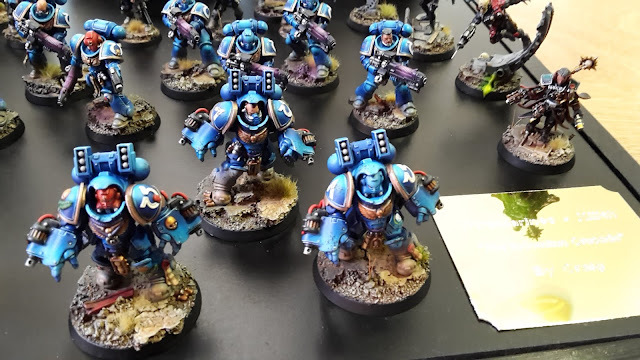 Today's battle report sees my Genestealers Cults army take on Ben and his Thousand Sons army. 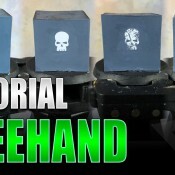 We would be playing the Kill Confirmed maelstrom of war mission, with Spearhead Assault deployment. The mission was three cards per turn, with kill points as well. I decided to go for two Battalions to give me a good number of command points to use. This allowed me to field all four of the characters, taking the Acolyte Iconward for the first time. 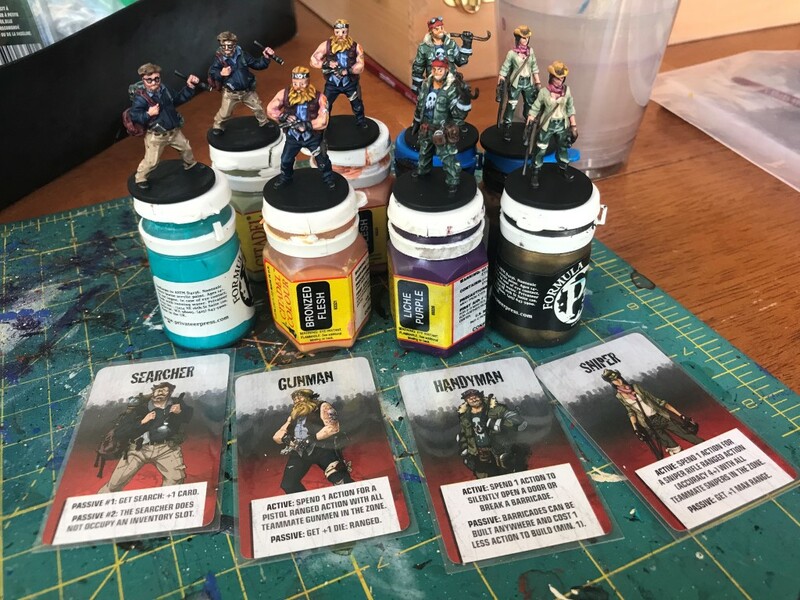 The new reserves rules would also have an effect on the army, as I would need to keep some squads of Acolytes on the table, rather than putting them all in reserve as I normally would.